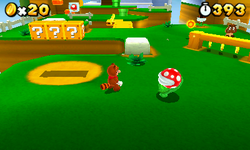 World 2-1 is the first course of World 2 in Super Mario 3D Land. It is an outside course around a white castle. In the original E3 2011 demo, it is the first selectable course. The icon for this level is the level's central white castle (resembling Princess Peach's Castle) surrounded by four Lifts. In the first area, a pair of Binoculars that Mario can use to see Toad near the Flagpole, some Goombas, some dandelions — one of them hides a Super Mushroom; three ? Blocks and a Piranha Plant can be found. In the next area, there are some Coins and a Fire Piranha Plant surrounded by two wood Goombas. The player must turn to the left to find a Roulette Block and a gap and three moving platforms to go to the other side. If Mario goes to the far left, he finds a small path with three wood Goombas and a real Goomba. In the next area, there is a small mount with some coins. In the right side there is a P-Switch that produces 16 notes and a Warp Pipe. The Checkpoint Flag does not appear in the level. Soon, Mario must go up to the top of a castle. In the way, there are Goombas and Tail Goombas. Three trampoline platforms send Mario to a Warp Box. It warps him to a tiny platform floating a bit far from the top of the castle. To reach there, he needs to press a ! panel to make several platforms in the direction of the Flagpole. When Mario lands on the castle, he can use more green reproducing platforms to reach a trampoline to grab the Flagpole's top. Star Medal 1: It is given by Toad, after Mario finds him using the pair of binoculars. This Star Medal lands on the top of raised area, before the castle area. Star Medal 2: Next to the castle area, there is a pipe with a Piranha Plant. Mario must defeat it and enter in the Warp Pipe. He will be transported to an optical illusion room, where the medal is above a block. Star Medal 3: In the far right of the first story of the castle, the Star Medal is visible a little behind the place where Mario is. To take it, he can Long Jump to it, fly with Tanooki Mario or back a little until find a way that leads to the medal. The Golden Tail Goomba was shown in this course in early trailers. This page was last edited on April 16, 2019, at 19:41.